Ready for a jump start? From hot peppers to Greek-style yogurt, these foods all aid in weight loss. 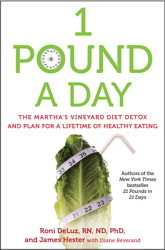 From 1 Pound a Day: The Martha’s Vineyard Diet Detox and Plan for a Lifetime of Healthy Eating. Oatmeal: To jump-start your metabolism in the morning, start the day with a bowl of steel-cut oatmeal. A superfood, oatmeal is rich in fat-soluble fiber, which takes a lot of calories to break down. Eating oatmeal can decrease cholesterol levels as well. Grapefruit: can reduce insulin levels. Lower insulin levels after eating can help your body process food more efficiently. With less insulin, you burn more calories and store less energy as fat. day. The group that ate the fruit lost more weight than the women who did not. Hot peppers: Chemical compounds in spicy foods can kick the metabolism into a higher gear. Capsaicin gives peppers their heat. Eating a tablespoon of chopped red or green chile pepper can boost your metabolic rate temporarily. Spice up pasta dishes, chili, and stews with red pepper flakes. Capsaicin keeps the calorie burning elevated long after you have finished a meal. down. Protein is needed to build lean muscle mass, which burns more calories than fat. Salmon and tuna: High levels of leptin are associated with slower metabolisms and with weight gain. Eating fish is a good way to lower leptin levels. The omega-3 fatty acids found in salmon and tuna cut leptin levels and help your body process foods more effectively. Omega-3 fatty acids are also found in anchovies, sardines, mackerel, and flaxseed oil. Soup: Studies show that people who eat soup first consume less solid food for the rest of their meal. One study found that soup offered an appetite-reducing combination of liquids and solids that prevented the intake of excess foods, speeding up the metabolism for fat burning. Greek-style yogurt: Yogurt is packed with calcium and protein. It gives you lots of energy and helps in the building of lean muscle mass. Yogurt with live cultures helps to regulate your digestive tract by contributing microflora. Broccoli: Rich in calcium and vitamin C, broccoli helps you to burn calories faster. Calcium activates your metabolism while vitamin C helps you to absorb more calcium. Almonds: Though high in calories, almonds are packed with essential fatty acids that boost your metabolism. Green tea: The caffeine in green tea accelerates your heart rate and speeds up your metabolism. Another chemical present in green tea, epigallocatechin gallate (EGCG), stimulates the nervous system and helps to burn calories at a faster rate. Black coffee: The shot of caffeine you get from coffee increases energy and concentration. If consumed in moderation, coffee can cause a short-term boost in your metabolic rate. 1 Pound a Day offers a powerful detox that will change your life. You’ll get advice on how to customize the program, plus practical tips and support that will make the detox a snap and guide you through a transition to healthy eating and a lifetime of wellness!